The full name of the Medicine Buddha is Bhaishajyaguru Vaiduryaprabha, the Healing Master of Lapis Lazuli Radiance. Like Shakyamuni he wears the robes of a monk and is seated in the full cross-legged posture. His left hand is in the meditation mudra, resting in his lap and holding a begging bowl filled with medicinal nectar and fruit. His right hand rests upon his knee with palm facing outward in the mudra granting blessings and holds the stem of a myrobalan plant (Terminalia chebula), renowned as the king among medicines because of its effectiveness in treating both mental and physical diseases. 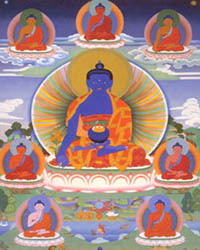 In traditional Tibetan tangkas, the Lapis Healing Master is often shown in the company of seven other Medicine Buddhas, one of whom is Shakyamuni himself. And in depictions of his eastern buddha realm known as Pure Lapis Lazuli, the Healing Master is generally flanked by the two leading bodhisattvas of that pure land, Suryaprabha and Chandraprabha, respectively All-pervading Solar and Lunar Radiance. The most distinctive feature of this Medicine Buddha is his color, the deep blue of lapis lazuli. This precious stone has been greatly prized by Asian and European cultures for more than six thousand years and, until relatively recently, its ornamental value was on a par with, or even exceeded, that of the diamond. An aura of mystery surrounds this gemstone, perhaps because of its principal mines are located in the remote Badakshan region of northeast Afghanistan, an all-but-inaccessible area located behind the Hindu Kush. One commentator has written, "the finest specimens of lapis, intensely blue with speckled waves and swirls of shining gold-colored pyrite, resemble the night aglow with myriads of stars." Traditionally this beautiful stone was used to symbolize that which is pure or rare. It is said to have a curative or strengthening effect on those who wear it, and its natural smoothness allows it to be polished to a high degree of reflectivity. For all these reasons ­ plus the fact that deep blue light has a demonstrable healing effect on those who use it in visualization practices ­ lapis is the color of the principal Medicine Buddha. If these sentient beings [those plunged into the depths of samsara¹s sufferings hear the name of the Lord Master of Healing, the Lapis Lazuli Radiance Tathagatha, and with utmost sincerity accept it and hold onto it, and no doubts arise, then they will not fall into a woesome path. In Tibet the Medicine Buddha is revered as the source of the healing arts for it is through him that the teachings embodied in the Four Medical Tantras, the basis of Tibetan medicine, came into being. As explained in the first of these Four Tantras, the Lapis Lazuli Healing Master was once seated in meditation surrounded by an assembly of four circles of disciples including divine physicians, great sages, non-Buddhist gods and bodhisattvas, all of whom wished to learn the art of healing. Rendered speechless by the radiant glory of his countenance, they were unable to request the desired teachings. To accommodate their unspoken wishes, the Medicine Buddha manifested two emanations, one to request the teachings and the other to deliver them. In this way, then, the Buddhist explanation of the various mental and physical ailments, their causes, diagnoses and treatment and the maintenance of health is said to have originated. Thus if all these twenty-five are in balance and the three factors of the (1) tastes and (2) inherent qualities of one¹s food and (3) one¹s behavior are wholesome, one¹s health and life will flourish. If they are not, one¹s health and life will be harmed. Attachment, hatred and bewilderment are the three causes producing imbalances of wind, bile and phlegm. Along with these, the four contributing circumstances of time, spirits, food and behavior cause the humors to increase and decrease. The imbalance then spreads over the skin, increases in the flesh, moves along the vessels, meets the bones and descends upon the solid and hollow organs. Treatment of disease and the maintenance of health are therefore primarily a matter of bringing the various elements of the body back into balance and this is accomplished through four progressive types of treatment. The first two involve changes in the type of food we eat and behavior we engage in. Only when these prove ineffective is the physician advised to prescribe medicine and only when this also fails is he or she to resort to external forms of treatment such as cauterization and the like. However, none of these types of treatment will have a lasting effect unless they are accompanied by spiritual transformation. If ignorance and its associated delusions remain festering inside, sooner or later they will give rise to disease and the recurring miseries of cyclic existence. 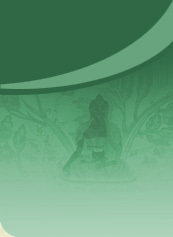 Thus Buddhas such as Shakyamuni and the Lapis Healing Master are referred to as great physicians not because of their medical abilities ­ as great as these are ­ but because they have the compassion, wisdom and skillful means to diagnose and treat the root delusions underlying all mental and physical malaise. Please grant me your blessings.